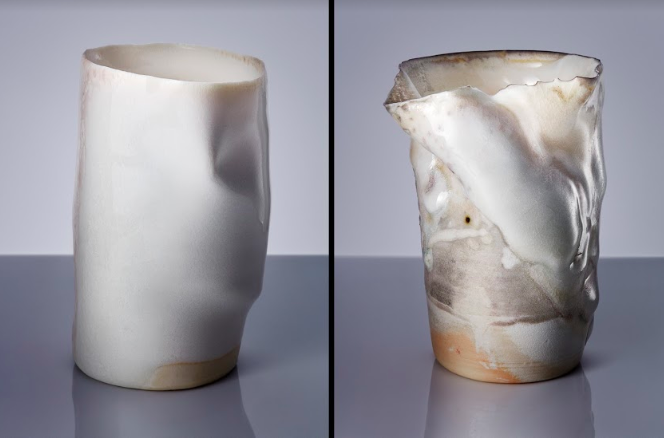 Elizabeth Phelps Meyer’s “Rough and Ready” Delicate Vessels, a micro-interview with Elaine Sexton. ELAINE SEXTON: You are juggling several projects, all in clay, and each with a separate but related focus. I think our readers would be interested in the origins of your work as social practice, your forthcoming exhibit, and how you’ve come to employ ceramics in your process. ELIZABETH PHELPS MEYER: My understanding of social practice as an art form is that it creates or galvanizes already existing communities around a shared difficulty or problem, and it does so by using the creative, generative force active in both the artist/organizer, and in collaboration with that community. While the art project itself isn’t likely to solve the problem, it can generate powerful and unifying bonds among people. These bonds can help open new paths or move people in new directions. I do admit a practical aspect to my projects, though, and like to offer my vessels in exchange for donations. I began working in ceramics intensively back in 2014, as I became interested in the capacities of vessels as intimate, enclosing spaces for various evocative substances one might consider sacred. I also feel that vessels are indirectly, abstract bodily referents – they have feet, bodies, and mouths. I relate to them on a visceral level. Vessels such as cups and bowls are also so simple, so ordinary. I love their humbleness and familiarity. Part of what I’m interested in in these installations is amplification through repetition. If one repeats a form many times, it’s familiarity is both affirmed and also made strange. I also came to love the spaces in-between, and the subtle relationships existing between the many vessels. Because they are hand-turned on the potter’s wheel, each one is slightly different from all the others, and in those variances I find that a great deal of space and pleasure opens up. I also just became obsessed with clay itself, not only because of its tactility and responsiveness, but because of its earth-origins. It seemed to me like an ideal medium through which to address not only issues of earth (such as carbon-based climate change) but also geopolitical issues. It is becoming increasingly important for me to learn about wild and non-commercial clays, to use clays that have site-specific meanings. But for my forthcoming exhibit, Each Day, Water: A Monument for the Water Protectors of Standing Rock and Beyond, I used a commercial English porcelain, because as an industrial material coming from Western Europe, I felt it had resonance with the history and forces of colonization, and this was effective for this project. My first vessel installation was created in the aftermath of the 2015 Nepal earthquakes, 1,000 Offering Bowls for Shedrub Ling. Each Day, Water is my second installation that involves a numerical iteration of vessels. In this case, I will select 365 vessels out of the many hundreds I’ve made, and display one for each day of the solar year. I began making these porcelains in October 2016, as news intensified of the police violence against the Water Protectors at Standing Rock. I wanted to join them. The way I found to do that, since I could not travel to the Prayer Camps, was to make these vessels that could both honor the water and the people risking their well-being to protect the water. 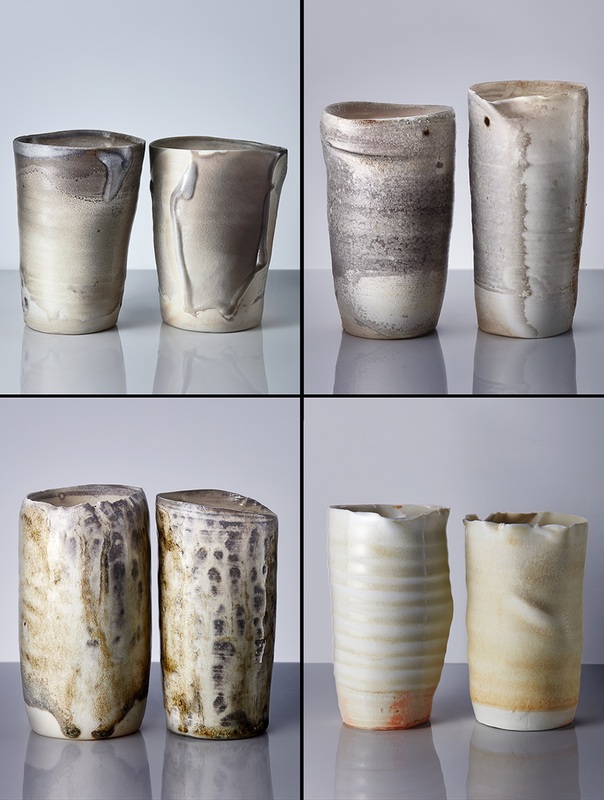 My work since then has also involved wood-firing these vessels in a variety of 3-day or 5-day anagama or noborigama kiln firings. I chose wood firing because of the way in which carbon often gets trapped in the glazes, and because the energy and path and ash of the fire becomes visible. The cups are meant to be both beautiful and also distorted, rough, reflective of the violence of the carbon/fossil fuel industry and the industrial-police state towards both the earth and the Water Protectors, a name that originated at Standing Rock during the time of the Prayer Camps because they were being called “Protesters” to the DAPL but they said, no we are “Protectors,” “Water Protectors.” Seeing and sensing the fire and ash and carbon was one of the ways I could accomplish this. So, I’ve spent many hours at various kilns in NY and NJ, doing all the types of labor involved with such firings, and this has been another primary aspect of making this work. I’ve learned so much from the direct contact with the wood and fire, of the alchemy of this atmospheric firing process. These vessels are like my burnt offerings, my ritual offerings, my heart-hand prayer. What is most essential for me about these installation projects is the audience participation that can either fortify already existing or create new human bonds of care – love, really – between living beings. Hopefully, the sense of devotion embodied by the large number of vessels on display helps create an atmosphere of love. The river water in each vessel is meant to suffuse the space with the energy of life, and the power of places from which the water was collected. One Water Protector called the cups “rough and ready,” and I liked that a lot. Because it is a fight; there is a front-line. I always feel bad that I’m not there, doing non-violent direct action in the pipeline path, and standing in the face of police. I do what I can, what I know how to do, and what I can tolerate. But the whole situation is intolerable; as it should be – intolerable to watch our planet getting poisoned over and over again in so many ways by the violence of a colonial-settler society that enables industrial extraction industries and advanced capitalism to ravage land, water, and life. Anyway, though the vessels are delicate and fragile and vulnerable, like our water ecosystems, they are also fiercely upright, and able to do the job they’re made for. A central aspect of this specific project has been to create a platform for listening and receiving the messages of Water Protectors. In the exhibit there will be multiple sets of headphones where audience is invited to listen to statements from Water Protectors of the Očhéthi Šakówiŋ (the Seven Council Fires composing the Sioux Nation), and also allied indigenous Water Protectors, and several vetted, dedicated non-indigenous allies. There are so many layers one could learn about what happened at Standing Rock. More and more of these stories will emerge in time, told by the people who lived them. But my project is meant to be a sort of ceremony, holding the initial medicine – water – mni – water of life, from these places of great power. There is a spiritual component to my connection with doing this. I’ve been accused of trying to fake an animistic worldview, in a day and age where that doesn’t exist anymore. But it does exist. There are still people who can feel the spirit of the water, and who can pray for the protection of the water, and who can thank the water. Note: All cup images are work from Each Day Water, A Monument for the Water Protectors of Standing Rock and Beyond. Medium: wood-fired porcelain, filled with water from Lake Oahe (Mni Sose, Missouri River) and the Cannonball River (Inyanwakagapi Wakpa), from the site of the Rosebud Water Protector Prayer Camp at the Standing Rock Sioux Reservation, Cannonball, ND.